UC Santa Cruz professors (from left) David Haussler, Richard E. (Ed) Green, and Sandra Faber will be featured in a panel discussion about the origins of life and the future of scientific research. 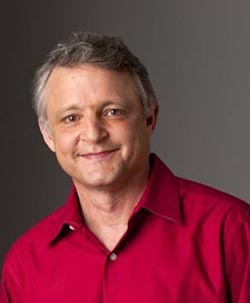 NPR science correspondent--and UCSC alumnus--Joe Palca (below) will serve as moderator of the panel. For more than two decades, acclaimed nature photographer Frans Lanting has documented wildlife from the Amazon to Antarctica, in an effort to promote understanding about the Earth and its natural history. A frequent contributor to National Geographic—where he served as photographer-in-residence—Lanting has been honored as “BBC Wildlife Photographer of the Year,” and received the Sierra Club’s "Ansel Adams Award." Lanting also happens to be a Trustee of the Foundation Board of UC Santa Cruz. And on October 15, he will join with the campus for a remarkable evening of art, science and life, at the Flint Center in Cupertino. Titled Evolutionary-Revolutionary, the event will open with a panel of top faculty from UC Santa Cruz, in a dynamic discussion about the origins of life and the future of scientific research—from the Big Bang to big breakthroughs. That conversation will be moderated by National Public Radio’s award-winning science correspondent Joe Palca, who graduated from UC Santa Cruz in 1982. 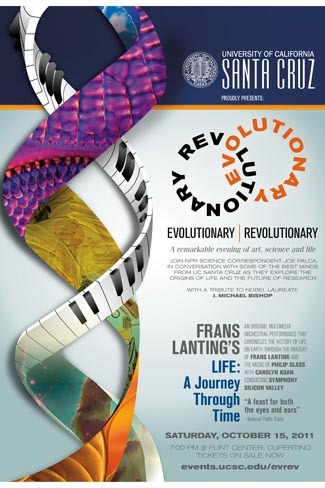 The second half of the event will feature Frans Lanting’s LIFE: A Journey Through Time—an original multimedia orchestral performance that chronicles the history of life on earth through Lanting’s imagery and the music of composer Philip Glass--with Carolyn Kuan conducting Symphony Silicon Valley. Described as “a feast for both the eyes and ears,” by NPR, LIFE will be performed in Silicon Valley for the very first time. It premiered at the Cabrillo Festival of Contemporary Music in 2006, and has since been presented at venues from Washington D.C. to Geneva, Switzerland. Lanting came up with the idea of LIFE more than a decade ago, while taking pictures of horseshoe crabs--a life form that has remained essentially unchanged over hundreds of millions of years. He consulted with experts in geology, paleontology and evolutionary biology, and spent the next seven years creating a visual narrative of life, assembled from nearly 200 images taken from every continent. “LIFE is a vision of the past, a celebration of the present, and a call to action to make sure there’s a future for all of us,” says Lanting. • Sandra Faber—University Professor of Astronomy and Astrophysics, a renowned astronomer and cosmologist whose work has had enormous influence on our understanding of the universe. • David Haussler— Distinguished Professor of Biomolecular Engineering, whose research on the human genome and cancer genomics is paving the way for intelligently designed medical therapies and personalized medicine. has helped pioneer the use of advanced sequencing technology to study ancient DNA extracted from fossil bones. The event will additionally include a tribute to Nobel laureate J. Michael Bishop--an American cancer scientist who received the 1989 Nobel Prize for Physiology or Medicine. For tickets and more information, go to events.ucsc.edu/evrev/ or call the UCSC Special Event Office at (831) 459-1438.